We, harpLabs Inc., built the app for one of the largest multicultural festivals in the world, Carassauga. The app was used by attendees in 2016 and 2017. Carassauga is a festival that takes place annually in Mississauga. Carassauga boasts to be the largest multicultural Festival in Ontario and is now recognized as the 2nd largest cultural Festival in Canada . Attendees hop from pavilion to pavilion located around the city within the course of 3 days. In 2017, there were 31 pavilions. Each pavilion represents one or more nation, and hosts performances, sells souvenirs, samples foods, and engages in other cultural activities. Figuratively put, Carassauga is a tour around the world. Flirting with this metaphor, tickets to the event are referred to as “passports”. 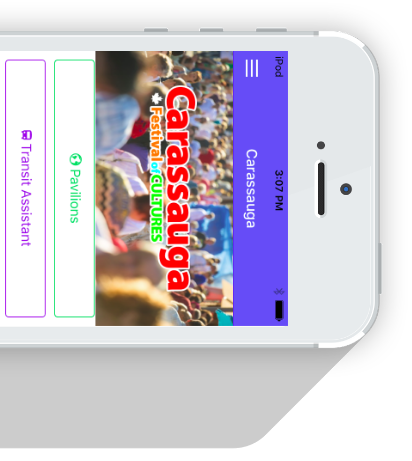 Carassauga contacted us to build their app in 2016. We were tasked to support both iOS and Android devices. Complementing Carassauga’s metaphor of being your ”tour around the world”, the app serves as your compass. The app provides pavilion listings, schedules, reviews, related social media posts, shuttle bus info, directions, and more. The main goals of the app was to guide attendees, and spark social media engagement during the festival. Carassauga employed the app in 2016 and in 2017. It was a big success. In case you’d like to read more about Carassauga and the app, Mississauga News wrote an article. Our customer's vision: We aim to understand our customer's business, mission, and rationale so the products we create perfectly suit their vision. The latest technology: We strive to employ the latest available technology so that your products are as advanced as can be. Rapid production: Our goal is to launch products fast to the market so our customers can be the early birds of their industry.